TOPIC: LORD, WALK ON THE SEA AGAIN! Verses 24-27 (Matthew 14) says; “But the ship was now in the midst of the sea, tossed with waves: for the wind was contrary. And in the fourth watch of the night Jesus went unto them, walking on the sea. And when the disciples saw Him walking on the sea, they were troubled, saying, ‘It is a spirit’ and they cried out for fear. But straightway Jesus spake unto them saying, ‘Be of good cheer, it is I; be not afraid’. “Remember that Jesus Christ is the same yesterday, today and forever. What He did before, He can and will do for you this year. By walking on the sea, by walking on water, He was teaching the world a lesson: NATURAL LAWS AND RULES CANNOT DETERMINE YOUR DESTINY! Yes! He was teaching the world that HE IS THE PROTOCOL BREAKER AND ALL THINGS ARE UNDER HIS FEET! In this year of STORY TO GLORY, the STORM CALMER will walk on the raging seas of your life and calm every storm! By walking on water, He was sending you a clear message. “I HAVE NOT LOST CONTROL! I AM IN FULL CONTROL OF YOUR LIFE AND MINISTRY! I KNOW YOUR PAST STORIES AND I HAVE COME TO LIFT YOU FROM STORMS will become supernatural under My World: Nothing takes Me by surprise! I know our storms and I will SUSPEND NATURAL RULES AND BREAK PROTOCOL IN ORDER TO GET TO YOU – ON TIME! Yea! I am the “ON-TIME GOD” and I use your BATTLE STORIES phase to produce the various phase of my GLORY in you. “Thank you Jesus! Note that by WALKING ON THE SEA, the LORD was also sending a loaded message that: I CAN DO ANYTHING AT ANY TIME, ANY WHERE, TO GET TO YOU ON TIME”. Do you know that WALKING ON THE SEA was the QUICKEST ROUTE AND THING to do at that hour of the night when boats had gone to sleep? Ah! The Lord will ACCELERATE the ACCELERATABLE in order to RESTORE your lost years of GLORY! He will talk on the sea or take the QUICKEST ROUTE TO CHANGE YOUR STORY TO STORY! I STORY TO GLORY! I SEE NEW SPEED COMING for your life ministry in this fasting programme! I see DELAY being crushed under the anointing! One of your daily prayers this year should be; “LORD, WALK AGAIN ON THE “SEA” AND COME THROUGH FOR ME!” Note that the sea of Tiberias was about ten miles in breadth, and the disciples had sailed about four miles. So they were literally in the midst of the sea facing a real storm, waves and tempest, Oh! Whatever storm you may be facing in the midst of the sea (Journey) of your life shall be arrested in this fasting program and at the WORLD ANOINTING STORY TO GLORY NIGH! Wow! Note also that The LORD showed up at the FOURTH WATCH of the night. That means at the time nearer to day break, which also means NEW DAWN. The first watch was from 6pm-9pm; the second from 9pm-12am! The third was from 12am – 3am! And the fourth was from 3am – 6am which was dawn or morning. I see a NEW DAWN of STORY TO GLORY locating your address in this 2019. Yes! “Weeping may endure for night but joy comes in the morning” (Psalm 30:5). Halleluiah! This prayer and fasting program and THE WORLD ANOINTING STORY-TO-GLORY NIGHT OF JANUARY 25TH 2019, SHALL MARK YOUR NEW DAWN! A new dawn over that marital storm, financial wave, business storm, health storm, that evil wave in your job, that career storm, that contrary situation, etc, shall not survive that night! This is your year! Amen and amen! Pray seriously now! 1. Psalm 121:4; Abba Father! I thank you because You neither sleep nor slumber over my life, family, ministry and all that concerns me. 2. Vs 4; LORD, I bless Your holy name because You will keep me alive to witness Your GLORY this year. 3. Psalm 103:4; O LORD, crown me with Your loving kindness and tender mercies today and always in Jesus name. 4. Psalm 19:14; LORD, let the words of my mouth and the meditation of my heart be acceptable in Your sight O Lord! TAKE SOME PRAISE/WORSHIP SONGS NOW TO YOUR GOD. War Against Haman-14 Day 17 And Day 18 – LORD, WALK ON THE SEA AGAIN! 5. THANK YOU LORD FOR THE GRACE YOU HAVE MADE AVAILABLE TO ME IN THIS FASTING PROGRAMME! THANK YOU FOR ANSWERED PRAYERS SO FAR AND FOR THE GLORY THAT LIES AHEAD. 6. You ANTI-GLORY powers, you are in trouble with my God, be arrested and paralyzed now by fire and thunder. 7. Jeremiah 33:3, LORD, I MUST SEE YOUR GORY this year and there is nothing the devil or anybody can do about it. He has lost the battle over my life in Jesus name. 8. Hebrews 13:8; LORD, if You did it before, You can do it again. Walk on the sea of my life and destiny this year in Jesus name. 9. Vs 8; LORD, WALK ON THE SEA AGAIN! Calm every storm and subdue every wave on my 2019 life’s journey in Jesus name. 10. LORD, WALK ON THE SEA OF MY LIFE DAILY THIS YEAR in Jesus name. 11. Psalm 30:5; O you storm, hear this: This is my NEW DAWN NEW SEASON; expire by fire and thunder now in Jesus name. 12. Vs 5; You storm confronting my life and ministry, my NEW DAWN has come; be arrested now in the name of Jesus Christ of Nazareth. 13. Vs 5; You powers producing storms into my destiny, enough is enough; catch fire now in Jesus name. 14. Matthew 14:24; You wave of rise and fall meant to rubbish my glory and turn me into a once-upon-a-time man/woman, be arrested now by fire in Jesus name. 16. Vs 24; Waves of failure, delay, stagnation, disappointment and frustration, I am not your candidate; backfire and scatter now by thunder in Jesus name. 18. Vs 25; LORD, WALK ON THE SEA AGAIN! Every scientific law, medical law and natural law militating against my glory, rising and advancement expire now by fire in Jesus name. 19. Vs 25; LORD, I raise the supernatural above every natural circumstance and situation thus year and I declare that I am more than a conqueror in Jesus name. 20. Vs 25; LORD, WALK ON THE SEA AGAIN! Calm every marital storm academic storm and financial storm this year, make my life Your GLORY CENTRE in Jesus name. 21. Vs 25; LORD, WALK ON THE SEA AGAIN! Save my life’s ship from drowning; I am Your glory centre this year in Jesus name. 23. Vs 26; LORD, WALK ON THE SEA AGAIN! Calm every business storm, health storm, job storm and career storm. Men and women shall know that I serve a living God this year this year in Jesus name. 24. Vs 26; LORD, YOU WALKED ON THE SEA TO BE ON TIME! You are the ON-TIME GOD! Therefore, no storm, wave and contrary wind shall overtake or overthrow me this year in Jesus name. 25. John 14:13 LORD, YOU WALK ON THE WATER TO BE ON TIME! Be on time for me this year and let nothing, no battle, condition or situation take me unawares. I am unstoppable in Jesus name. 26. LORD, WALK ON THE SEA AGAIN! Take over my life and destiny journey from January to December this year and crown my daily efforts with success in Jesus name. 27. Vs. 13; You powers stopping me from crossing to the other side (greater side) of my ministry, business and career, you are a liar, get out of my way now in Jesus name. LORD, ACCELERATE the “ACCELERATABLE” concerning my destiny this year in Jesus name. 28. Lord, crush every DELAY POWER! Paralyze the foundation of every DELAY storm confronting my destiny (pray it well). 29. Vs 14; LORD, I must cross over to the other side (better side) of my job, health, finances, relationships, marriage and destiny now and AT THE WORLD ANOINTING STORY TO GLORY NIGHT in Jesus name. 30. LORD, WALK ON THE SEA AGAIN! Suspend and scatter every NATURAL LAW working against my life and ministry in Jesus name. 31. LORD GOD, YOU ARE THE PROTOCOL BREAKER AND ALL THINGS ARE UNDER YOUR FEET! Do what no man or power can do for my life, family and ministry in Jesus name. 32. LORD, when You walked on the sea, there was GREAT CALM. I speak peace to every turbulent area of my life/ministry now in Jesus name. 33. Vs. 14, LORD, I am crossing over by force! I cannot be stopped, hindered, stagnated or demoted anymore. I am crossing over from STORY to my GLORY LAND and I shall manifest Your glory in all facets of my life, family and ministry. No more will I be afraid because You are walking on the sea on my life! I AM NOT ALONE! You shall turn the wind, waves storms and tempests of this year against themselves! LORD, just like Peter, I shall walk with You on the sea BY FAITH! Every storm is under my feet and I soar above the winds and the waves by the power of the supernatural. RULES ARE BEING BROKEN FOR ME! My God is coming ON TIME for me! Yea, He is SUSPENDING every PROTOCOL for me and I know that men shall see that my life, family and ministry are from STORY TELLING to GLORY SHOWCASING! Amen and amen! 34. Prov. 23:18 – In Your Own Words, Pray Seriously About ! Your Personal 2019 Prayer Point And Expectations Now! They Shall Not Be Cut Off in Jesus name. Amen! (Bring them to TBS). 35. I shall be established in righteousness this year. Because the LORD OF GLORY is my God, my GLORY shall not elude this year. 36. Pray about the 12 months of this year as led now; ENOUGH IS ENOUGH! This is my year to move from STORY to GLORY! My GLORY LAND must locate me in January, February, March… (Mention all the remaining months of 2019). 37. As I sow my STORY TO GLORY SEED, (“CHANGE OF RULE” SEED) by faith, and pray the SPECIAL “GLORY-PROVOKING PROPHETIC PSALM” (GPPP), which I will pray for 5 weeks every satanic anger or wicked rage against my destiny shall end up in SHAME in Jesus name. War Against Manna-14 Day 17 And Day 18 – LORD, WALK ON THE SEA AGAIN! 38. Ecc 11:4 – “He that observeth the wind shall not sow; and he that regardeth the clouds shall not reap”. I reject DISCOURAGEMENT in SEED SOWING! I refuse discouragement IN SEED SOWING this year! I refuse to allow battles or DELAYS of the past to stop my SOWING AGAIN this year! I shall sow my “STGS” – “STORY TO GLORY SEED”, “ACCELERATE THE ACCELERATABLE” SEED in this fasting programme in Jesus name. As I sow my “STGS” – STORY TO GLORY SEED and receive my SPECIAL “GLORY – PROVOKING PROPHETIC PSALM” (GPPP), which I pray for 5 weeks, the God of MERCY, who knows the number of hairs on my head, will move me from “STORY TELLING” to “GLORY SHOWCASING” this year in Jesus name. 40. As I carry out the PROPHETIC ACTION of PRAYING WITH SAND which I will bring from my place of residence, work place, ministry arena, village square, school ground, father’s house, mother’s house business area. Etc, AT THE WORLD ANOINTING NIGHT OF 12 PROPHETIC ARROWS, O EARTH, vomit and release my Glory this year by fire in Jesus name! War Against Haman-14 Day 17 And Day 18 – LORD, WALK ON THE SEA AGAIN! 41. O EARTH, vindicate me and swallow up every RAGE, ANGER EVIL VOW OR WICKEDNESS of my HATERS! Swallow up haters of my destiny this year, every arrow shall deliver to my life. 42. As I carry out the PROPHETIC ACTION of shooting my 12 PROPHETIC ARROWS AT THE WORLD ANOINTING NIGHT, each for the 12 months of this year, every arrow shall deliver to my life, family and ministry my GLORY LAND in Jesus name. 43. Pray about the WORLD-ANOINTING-STORY-TO-GLORY NIGHT NOW! Decree that NOTHING WILL STOP YOU from being there! 44. Pray for all ODM workers and all ministers for the unction to function that night! Pray for all the types of workers and music ministers of that night! 45. Pray for me, Dr Chris, for fresh fire and more unction to function that night! For unbreakable partnership with my three Friends that night! 46. Pray and loose journey mercies! Decree Journey mercies (TO and FRO) for all who will travel far and wide from across the globe to Lagos that night. Loose visas and nullify immigration barriers! 47. Bind the spirit of losses, accidents or death. 48. Decree that there will be GREAT JOY in your land after that programme! 49. Thank the LORD for answered prayers and for your STORY TO GLORY testimony this year and beyond in Jesus name! 50. Scatter every gang up against the WORLD-ANOINTING-STORY-TO-GLORY NIGHT! Command every evil hand stretched towards that night to dry up. 51. Thank you LORD, for answered prayers and for my promised Glory this year and beyond! War Against Haman-14 Day 17 And Day 18 – LORD, WALK ON THE SEA AGAIN! Previous Post:Our Daily Manna 21 January 2019 – LORD, WALK ON THE SEA AGAIN! 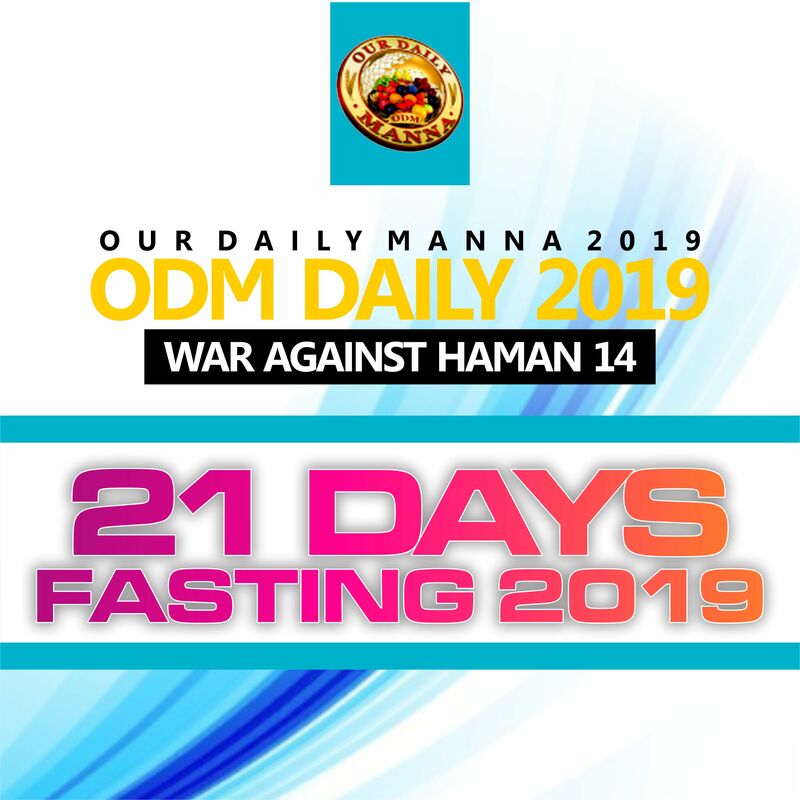 Next Post:Our Daily Manna Devotional 22 January 2019 – YOUR LIFE WILL DEFY EXPLANATION! ELOHIM WALK ON THE SEA FOR ME AGAIN !! ACCELERATE MY GLORY ELOHIM! !! pls i have been hearing announcement on the radio concerning the WORLD ANOINTIN NIGHT, about other viewing center, pls if i cannot come to lagos, can i attain the veiwing center in my state. Thank you Lord for walking on the Sea again and breaking all protocols concerning my Life, Job, My Mother, Wife, Child, Family and Moving us from Story to our Glory season. ZAMBIA: +260-9667-485-41, GHANA: +233-263-991-400, SOUTH AFRICA: +27-79-284-9137, U.K.: +44-7818 36-8223. USA: +1-347-404-2121, NIGERIA: +234-802-342-1513, +234-807-314-6863. E-MAIL to:orderodm@gmail.com; WHATSAPP to: +234 8144-044-226, 080-7314-6863, 080-2315-4316 after sowing! We shall not fail to reply by Hid grace. This is your year!